Fun kart is especially designed to let you to discover the karting race. If you’re looking for thrills, come to Speedkart! Choose the fun kart (160cc) to try for the first time this sport easy for beginners or experimented drivers. 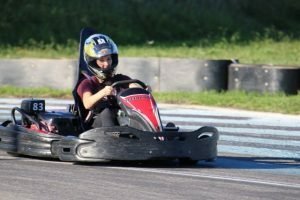 This kind of kart is perfect to offer you a funny race in a safe environment: adjustable pedal mechanism, roll-over protection, comfortable bucket seat, bumpers all over the kart, silentbloc for more flexibility. You can drive fast without danger! We have a system that stops all the karts at the same time to avoid shock or accident. It’s an important thing for our team to offer you comfort and funny moments. Fun karts are ideal for discover karting: families, teenagers, beginners will enjoy it! In case of danger, a system to stop all the karts in the same time exists.